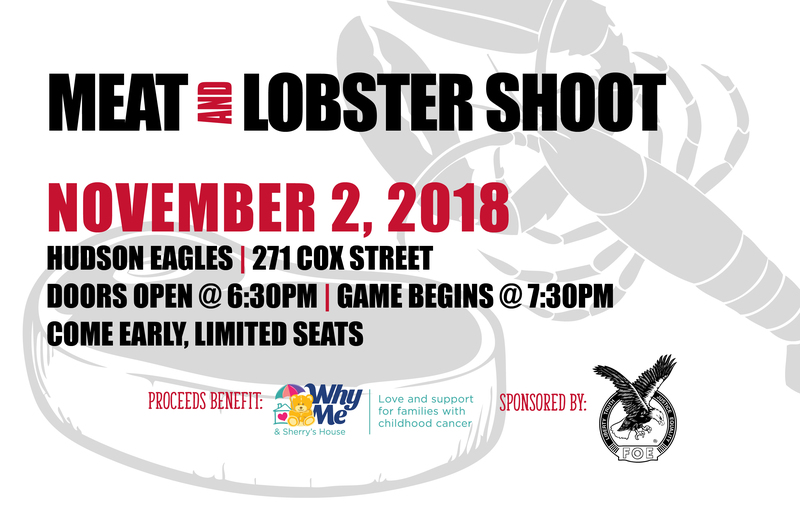 Join us on Friday, November 2nd for a Meat & Lobster Shoot at the Hudson Eagles. We are sure you are asking what is a Meat & Lobster shoot! There are no guns involved. It is very similar to bingo where you will pay per card to play, and can play multiple cards. Winners will receive meat and/or lobster with all the proceeds benefiting Why Me. Take a gamble on some meat for us! You do not need to register in advance for this event, but we do encourage you to arrive early. Doors open at 6:30pm with limited seating available, play starts at 7:30pm, light appetizers will be available, and but feel free to bring your own!